A group of players assemble on a stage, and put on a play. 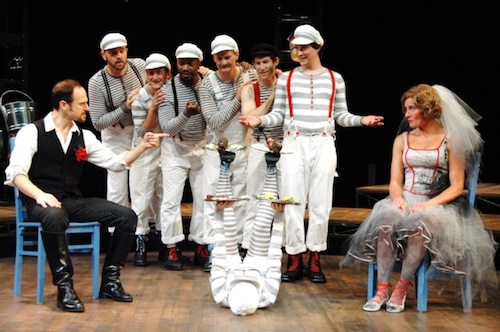 With this premise, the design for this production of The Taming of the Shrew draws its inspiration from circus, cabaret, and magic research of the turn of the 20th century. A very restrained palette helps create an autonomous and playful world, where actors exchange clothes a vista, stripping down to the same acrobat-inspired underwear... Ensemble actors, part-clowns, part-construction workers, morph fluidly from one ancillary character to the next, adding a few props to their base silhouette.